Otto Preminger’s complex and clever 1952 film noir about how salt of the earth ambulance driver Frank (Robert Mitchum) becomes mixed up with femme fatale Diane Tremayne (Jean Simmons) is certainly something of an overlooked gem. Coming almost a decade after Preminger’s seminal noir Laura and just before he hit paydirt with sickly sweet romancier The Moon is Blue, Angel Face is premier Preminger. Simply but atmospherically shot and full of suggestive dialogue there is a real air of venal mystery at play here. Preminger and Mitchum apparently hated each on the set, but producer Howard Hughes refused to let Preminger sack Mitchum. 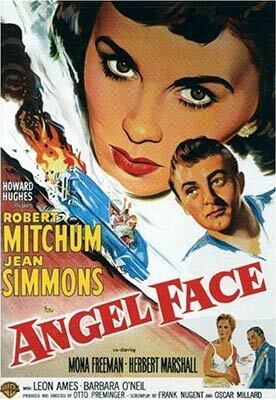 Mitchum returned the compliment by delivering arguably the darkest and most ambivalent performance of his career. Ironically the two men worked together again two years later on adventure film River of No Return starring Marilyn Monroe, in which Preminger insisted his stars do all their own stunts with near tragic results. They certainly don’t make them like Preminger anymore. This is a budget price DVD (£5.99) with minimum extras.